I’m writing to you today from what I believe to be the crown jewel of the entire Best Western hotel chain. By this, I mean the place has a hot tub, a restaurant that serves prime rib, a bowling alley (a bowling alley! ), and wireless Internet that worked for approximately seven glorious minutes yesterday evening, provided, of course, that I operated my computer while standing in the closet. Really, it’s great. I’d leave a review, but the rating system is online. 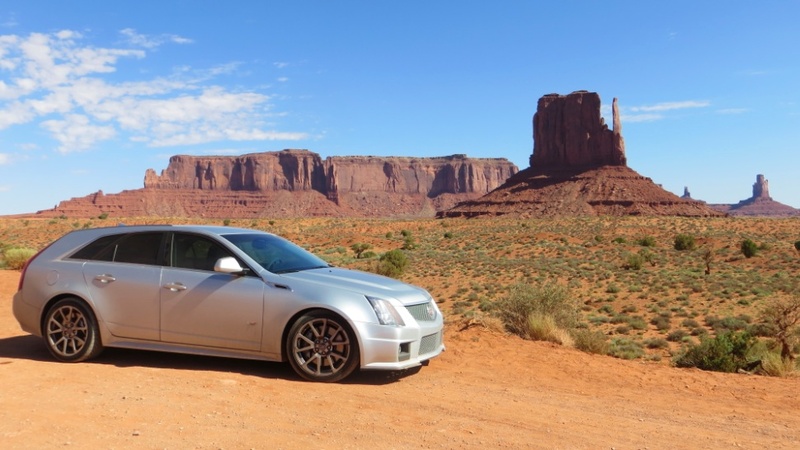 The reason for my hotel stay is that I am currently taking my Cadillac CTS-V Wagon on a 5,500-mile roadtrip across the country and back. Some of you will remember this. 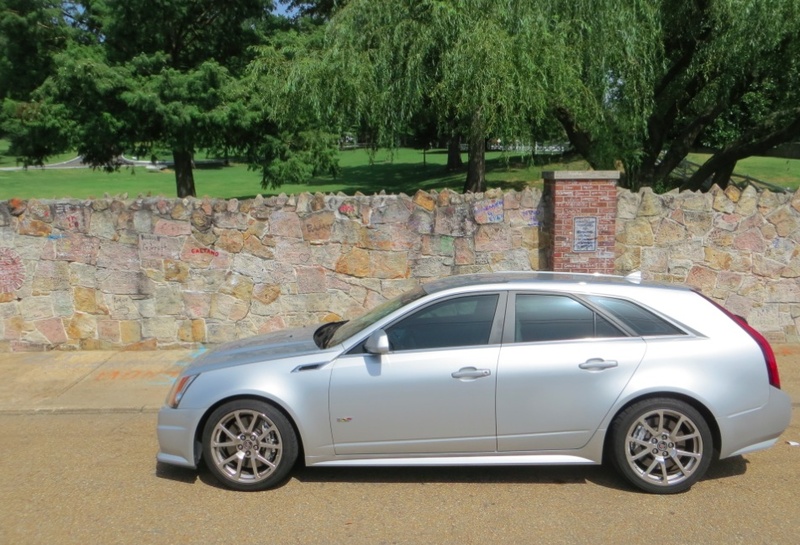 For those who don’t, a little refresher: I am currently taking my Cadillac CTS-V Wagon on a 5,500-mile roadtrip across the country and back. My girlfriend and I intended to start our roadtrip around 7:30, which, thanks to Roadtrip Time, meant that we actually left around 9. Roadtrip Time is a well-documented phenomenon in which, no matter how long you allow for activities, things always take considerably longer when you’re on a roadtrip. Really: you could budget 45 seconds for “peeing” only to look at your watch and realize you’ve spent 30 minutes at it, and you’re now projected to arrive at your hotel approximately nine hours late. Anyway, for those of you who want to know about the car: day one was mostly uneventful. The rear seats are down because the back is full of stuff, which means I’m basically driving an enclosed El Camino. Yes, onramps are fun. No, rain is not. And to the guy in the G8 GXP who attempted to race me at 1am on I-40 in Oklahoma City: sorry, but my car was loaded down with Elvis memorabilia. Day two started with some excitement thanks to a low tire pressure light. I’m close friends with this light because it goes on every few weeks in my Range Rover, usually just to remind me that it is, in fact, capable of illuminating. In the Cadillac, a tire actually was low, so we filled it with a precise amount of gas station air (also known as: however much the machine spit out before it shut off) and we were back on the road. The rest of the day was largely uneventful, though we did visit three highly important US cities: Amarillo, Texas; Albuquerque, New Mexico; and Gallup, New Mexico. I say “highly important” because these three cities are so completely devoid of anything memorable that I believe a striking enemy would simply forget to destroy them, thereby making them tactical strongholds. 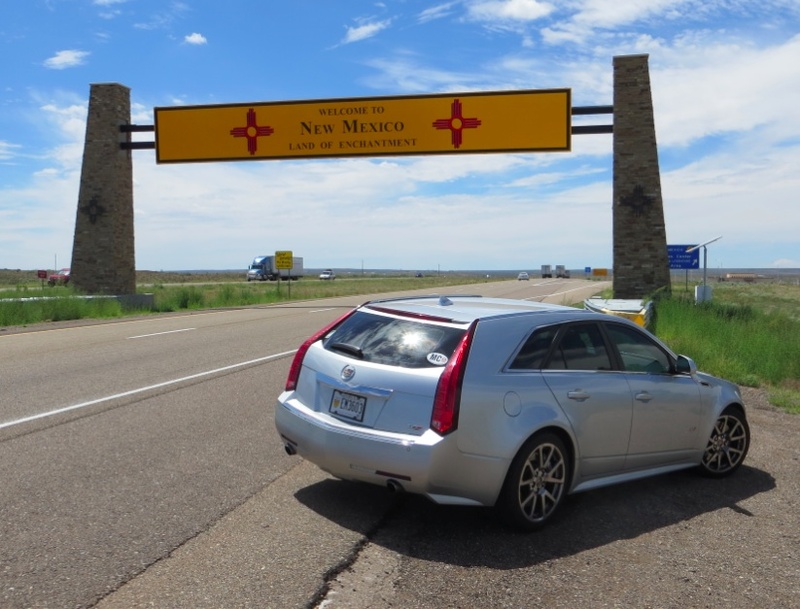 The automotive highlight: on the 192-mile stretch from Gallup, New Mexico, to Kayenta, Arizona, we somehow averaged 20.22 miles per gallon. I say “somehow” because these were mainly two-lane highways, which meant I did a lot of opposite-side passing. For those who are unfamiliar with such driving, let me just say that few experiences in life equal the sheer terror placing all of your trust in the highway department’s dotted road lines in the middle of the night. 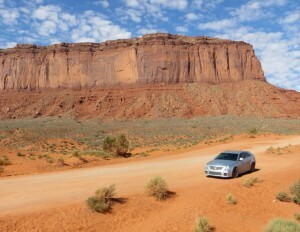 Day three didn’t involve big miles (only 277) but it did include two major sights: Monument Valley and the Grand Canyon. For those unfamiliar, Monument Valley is a large collection of enormous red buttes that tower over the desert on the Arizona/Utah state line. 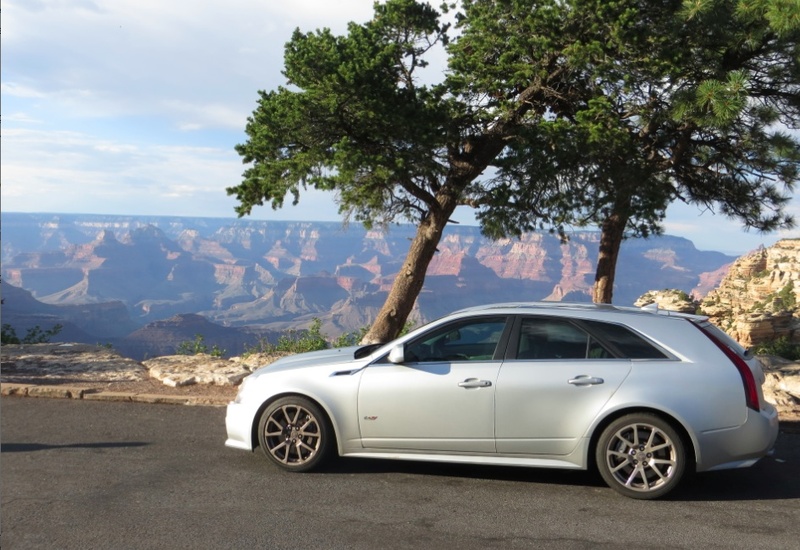 The Grand Canyon, meanwhile, is a large collection of foreign tourists who park crooked because they’ve rented a Ford Expedition, even though the largest vehicle they had previously driven was a Volkswagen Polo Diesel. No, I’m kidding. There’s also a canyon there. But the real automotive highlight was taking the Cadillac down the off-road trail at Monument Valley. Here’s what happened: we were warned before entering the park that this would be a “rough” trail. But then we saw people driving Chrysler Sebring convertibles on it, which caused us to think: How bad can it be? This was a bad idea, primarily because it turns out the famous PJ O’Rourke saying “the fastest car is a rental car” could be modified for Monument Valley purposes to instead be “all rental cars are Jeeps.” At one point, I was passed by a Nissan Sentra. However, there is a silver lining: I can now vouch for the impressive off-road capabilities of the Michelin Pilot Sport. So there you have it, folks: a report from our first 2,000 miles on the road. We have at least 3,500 miles left to cover (and probably more) so expect another update soon. I just have to make it to the next Best Western, where the wireless username will be “Guest,” the password will be “Guest,” and the Internet speed will be about the same as calling a friend and asking him to describe what’s on my favorite websites. I suppose it’s better than sleeping in the Cadillac. OK, so I dissed you pretty hard for not getting a manual car so this may sound odd – but when are you going to write about the car? So it has good off road tires… and the back seats go down to store stuff… OK. Maybe describe how/why rain is not good? Average speed to get the stellar mileage you’re seeing? Fastest you’ve taken it so far? Had issues passing on a two lane? Really? Shouldn’t this thing make passing a joy? And if not, why? Have you tried hyper mileing in it yet? I hope you’re mind is racing now with possibilities. Cheers. There’s more in the other two posts, but I take a very different view to car reviews than many journalists (I use the term ‘journalist’ loosely to describe myself!). I don’t think a truly great review can be done after 2 hours or even 2 days. Only once I get back from the trip do I finally plan to start getting into the nuts and bolts of the car and how it drives, etc. I’m not as experienced as some guys who can spend an hour in a car and know exactly how it compares to class rivals. Plus- I’ll own this thing 6 months and I’ve only had it 2 so far. There’s a lot more coming. Yeah – the other posts came through after I had written the above. But they were still wanting for more car review stuff too. I think if you throw in 2-3 more sentences per 1000 miles that are directly related to the car it would help satisfy those of us less interested in your wireless internet issues and more interested in the $40K (I forgot what you paid) wagon you’re going to own for 6 months. In a year or so I’m hoping to afford a 2007 CTS-V so in a few years after that I might just be in the market for one of these. On a road trip of that extent did you take along any of your favourite music with you? Or were you listening to the local Radio Hicksville as you were able to receive it? I would (and will! )like to travel that sort of distance, but down here in NZ you cant travel any further than say 950k’s before you are on a familiar road again!